Welcome to the premier online educational center for shoulder ultrasound. This site was developed out of my desire to provide a one-stop center for the educational needs of orthopaedic surgeons and other physicians who have a desire to learn more about shoulder ultrasound. In-office MSK ultrasound performed by the orthopaedic surgeon, rheumatologist, physiatrist, sports medicine specialist and other subspecialties is growing at an extraordinary pace. There are numerous benefits to in-office ultrasound including improved efficiency, quicker diagnosis, patient education, and health care cost savings. The exams are quick, safe, and painless. Unlike MRI or CT scans, MSK ultrasound allows for the performing physician to get as many live static and dynamic images as necessary to make a diagnosis. Traditionally the availability of quality MSK ultrasonographers in many areas has been inconsistent. This can lead to long wait times to get studies done, multiple patient appointments instead of just one, and inconsistent quality of the scans performed. The ability of office-based physician to provide MSK ultrasound is revolutionizing the way care is delivered to millions of patients. One of the driving forces allowing for the transition of shoulder ultrasound to move from the radiology suite to the private practice physician's office is the advent of the portable laptop ultrasound machine. In the past, the machines required to get the quality images needed to visualize the rotator cuff were large, stationary scanners that were priced well out of the budget of most private practitioners. Over the last few years there has been rapid development and improvement in laptop sized ultrasound machines that are ideal for the office-based physician who has a desire to perform shoulder ultrasound. The costs have come down considerably, and the image quality has improved tremendously. 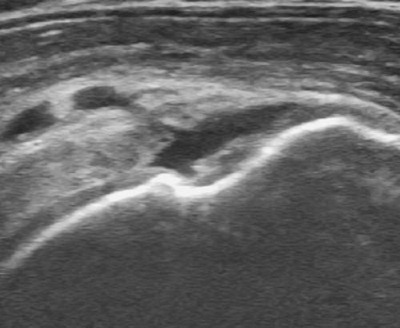 All of the shoulder ultrasound images shown on this site are from portable, laptop machines from my office on my patients. If you are a physician in Southern California and are interested in highly trained medical professionals coming to your office to provide MSK ultrasound services such as diagnostic scans and ultrasound guided injections for your patients, clich here.